When you’re commuting in an unfamiliar place or using different modes of transit, what do you look for? And what sorts of symbols do transit agencies use to help commuters get where they have to go? Two key visual methods—representational graphics and icons—serve as visual cues that reinforce direction, location, modes and uses of transit. A variety of ways to access information are necessary to provide useful service. This could include audible cues, as well as visuals like maps, wayfinding symbols and even branding so people can identify different service providers. Icons and symbols are universally recognizable and good design ensures such images are located within clear lines of sight. Directional demarcations help residents navigate transit infrastructure, which is often underground, multi-tiered and confusing, particularly for out-of-town travelers. But icons are not just about wayfinding; they also ensure that a people can understand and identify transit regardless of literacy or language, help travelers and commuters switch between transit modes and routes, and enforce or legitimize rules of the road. Metro stations, train stations and streetcar systems have distinct ways of showing how to get from one area to another. 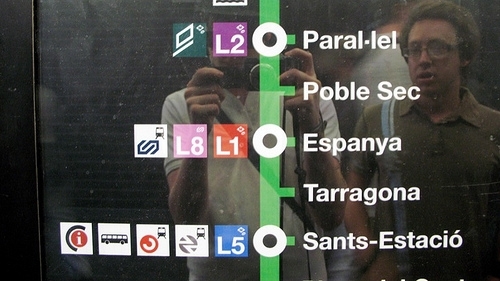 Barcelona’s Metro transit system maps, for example, use colored block displays indicating the line and direction of each route. The displays, like many of those found on light or heavy rail systems, use a horizontal layout showing all the stops. A ringed white circle shows transit connections, either to other rail lines or to other travel modes—a basic piece of information that many transit systems fail to employ. 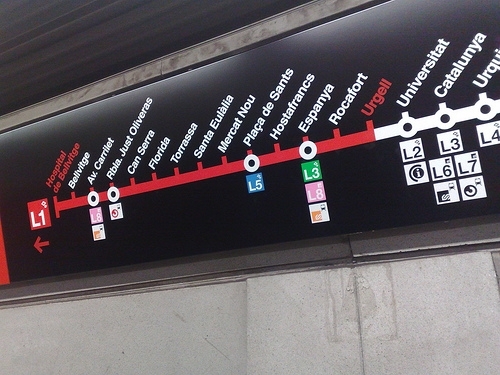 Barcelona's Metro system clearly indicates how to connect to other modes of transit at each stop. Photo by Rich Lyons. 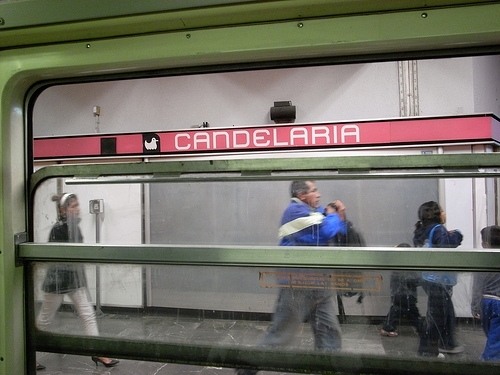 Mexico City’s Metro employs images at each stop that provide a visual cue for those unable to read. It is important to make this information accessible to everyone, especially those with limited education or income. The images also help to distinguish and differentiate various stops on a line, particularly important when indoor stops can look virtually the same. Designer Lance Wyman developed the icons for Mexico City's Metro. Images via his website. In the city of Recife, Brazil, the Metro stations are associated with symbols in a city where illiteracy is around 10 percent of the population. A metro stop for "shopping" in Recife, Brazil. Photo via Get Foxy. Symbols can also be used to signify right-of-ways, giving priority to certain road users. 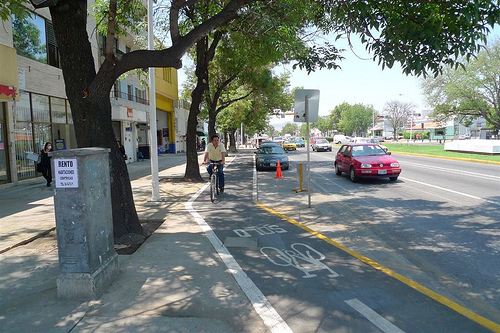 Below is an image of a bike lane in Guadalajara, Mexico, a city aggressively working to promote non-motorized transit. Guadalajara bike lane, with a universal bicycle symbol. Photo by ITDP. Another image of a bike lane in Glasgow, Scotland, below, uses exactly the same icon, but without the word solo, or “only,” (i.e. bikes only.) In Guadalajara, words and the painted line dually enforce the purpose of the lane. There are also traffic signals for bicyclists. They can help reinforce basic traffic rules, such as that bikers must stop at stop lights in most countries. At the same time, they signify to car drivers that bicyclists are sharing the same space, thereby improving overall safety, respect and awareness for both motorized and non-motorized road users. 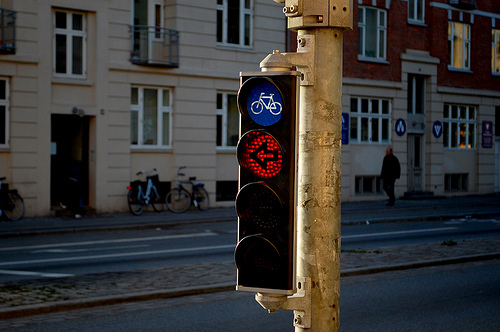 A cycling signal in Copenhagen. 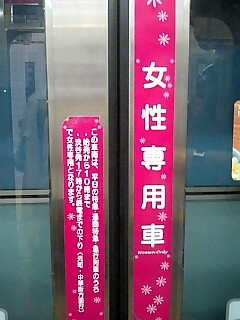 Buses and trains for women only have markers showing their restrictions, such as in Tokyo, where the color pink appears along the edge of a metro door, indicating a women-only car. The system also uses placards on the ground. 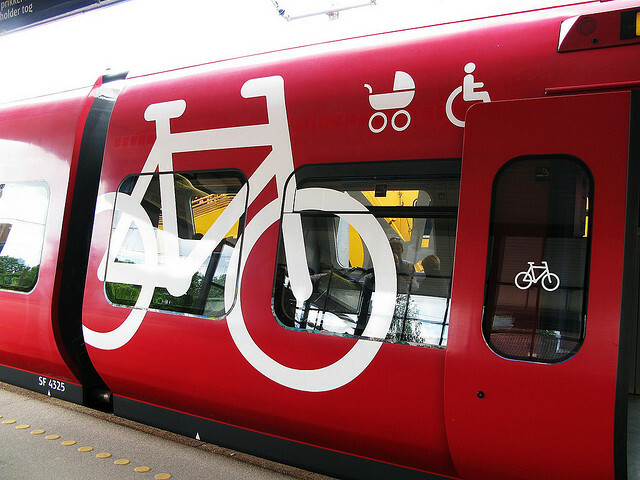 Another example we recently wrote about are Copenhagen’s Danish State Railway trains, which now have free, all-day capacity for bikes. The trains indicate their special usage with giant, plastered images of bikes, wheelchairs and strollers, which clearly communicate the message while symbolically representing the railway’s commitment to accessibility and non-motorized transit. The method employed in Copenhagen seems like the simplest way to indicate the purpose of a train car or bus. 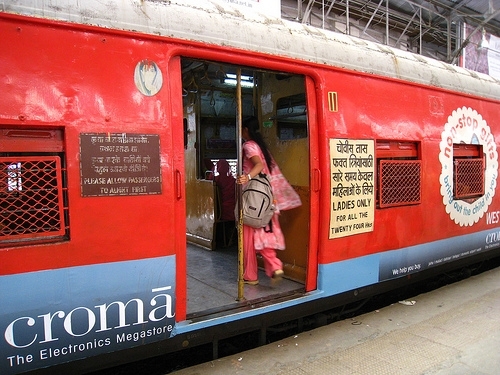 In Mumbai, India, like in Tokyo, words indicate that trains are female-only. But the message is not nearly as striking or clear as the images on Copenhagen’s trains. A women-only train in Mumbai. Photo by Francisco Martins. Good design is important to provide easy wayfinding and navigation. Street images should highlight how road space is used in clear ways without acting as overbearing indicators that keep drivers from being alert and thinking about the streetscape. Planner Hans Monderman’s work on public space shows that simpler streets make vehicle drivers think more as opposed to blindly following signs. Icons make people feel safer while creating the feeling of connectivity and organization. Transit users who can easily and quickly navigate their surroundings are more likely to continue using public transportation, and therefore, encourage others to use it, as well. It’s normal not to notice how an icon may help you find your way, but that’s part of good design—being unobtrusive, but necessary.